Lucky you! Because Bandai is releasing Sailor Moon "Miracle Romance Eau De Toilette." As JEFusion notes, the bottle is covered in ribbons, hearts, rhinestones, and a crescent crown, while the scent smells "of Bergamot orange, lemon, green apple, and peach, and then gradually continues with floral middle notes of rose, peony, and jasmine. It finishes with base notes of musk, sandalwood, amber, and vanilla." I'm no perfume expert, but that scent seems...complex! 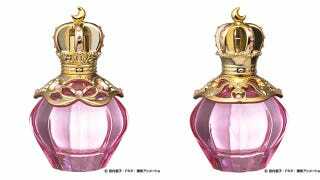 Priced at 5,400 yen (US$53), the fragrance will be out this November in Japan. No word about a Western release.